You'll be £19.99 closer to your next £10.00 credit when you purchase Decline and Fall of Napoleon's Empire. What's this? 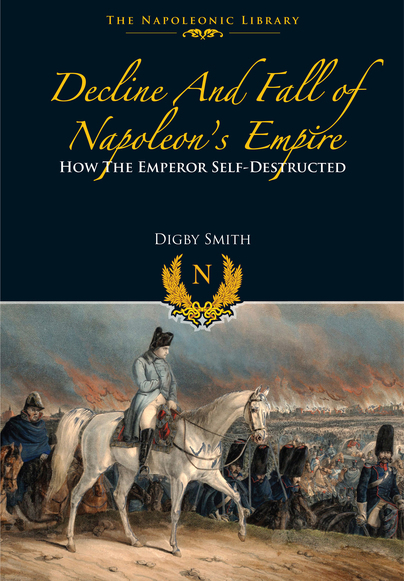 In this wide-ranging study of the Napoleonic regime, Digby Smith tracks Napoleon's rise to power, his stewardship of France from 1804–15, and his exile. He highlights his military mistakes, such as his unwillingness to appoint an effective overall supremo in the Iberian Peninsula, and the decision to invade Russia while the Spanish situation was spiralling out of control. Smith also scrutinises naval mistakes – notably, Napoleon's inability to comprehend the intricacies of naval operations, his impatience with his admirals, and his failure to invest in ships and men. Smith also tracks diplomatic and political errors, highlighting his inability to conclude lasting peace and to compromise. Smith finally addresses domestic and economic blunders, such as the establishing and maintenance of the Continental System across Europe, the imposition of a ban on direct trade with Russia (which led to France paying higher prices for naval stores of Russian origin after they passed through the hands of German middlemen), and the cost of creating various kingdoms and principalities and deposing incumbent rulers to place his relatives on their thrones. The author traces the period from 1804 to 1815, and Napoleon's final exile, in a ground breaking study of Napoleon's errors. Strongly Recommended. In this wide ranging study of the Napoleonic regime, the author looks at Napoleon’s rise to power, his stewardship of France 1804-1815 and his exile. He highlights Napoleon’s military mistakes, such as his unwillingness to appoint an effective overall in the Iberian Peninsula, and the decision to invade Russia while the situation in Spain was out of control. The author scrutinises Napoleon’s seeming inability to comprehend the intricacies of naval operations, his impatience with his admirals and his failure to invest in both ships and men. Next it is the turn of domestic and economic errors, such as the establishment of a ban on direct trade with Russia, which led to France paying higher prices for naval stores, and the cost of creating various kingdoms and principalities, deposing the incumbent rulers in order to replace his relatives on their thrones. There are a number of monochrome illustrations, mainly of the principal personalities of the period, a map of Europe 1812, eight appendices including such topics as the Chappe Telegraph System, Naval Supplies and Napoleon’s Finances. A bibliography and index round off the text. First published by Greenhill Books in 2005 and now in 2015 by Frontline Books, an imprint of Pen & Sword Books Ltd., this is a thoughtful, yet very readable analysis of Napoleon’s downfall. The author makes good use of Napoleon's own letters and orders, as well as the biographies and other works of his closest associates. This gives us a clear picture of Napoleon's working methods and his decision making process, and sometimes shows us the steps that led to some of his biggest mistakes. Digby Smith, also known to Napoleonic enthusiasts as Otto von Pivka, is a British military historian. The son of a British career soldier, he was born in Hampshire, England, but spent several years in India and Pakistan as a child and youth. As a "boy soldier," he entered training in the British Army at the age of 16. He was later commissioned in the Royal Corps of Signals, and held several postings with the British Army of the Rhine. After a career in the British Army Signal Corps, he retired and with a friend started a company selling body armor, followed by several years working in the telecommunications industry. After his second retirement, he lived for a while in Hanau, Germany, but has moved back to Britain.